You guys, Divine is performing in Kathmandu this Friday! The Mumbai rapper who started out as an underground artist in 2011, now one of the most influential Indian rappers, is headlining the fifth edition of Change the Way You Trip at Club Deja Vu on October 5th. 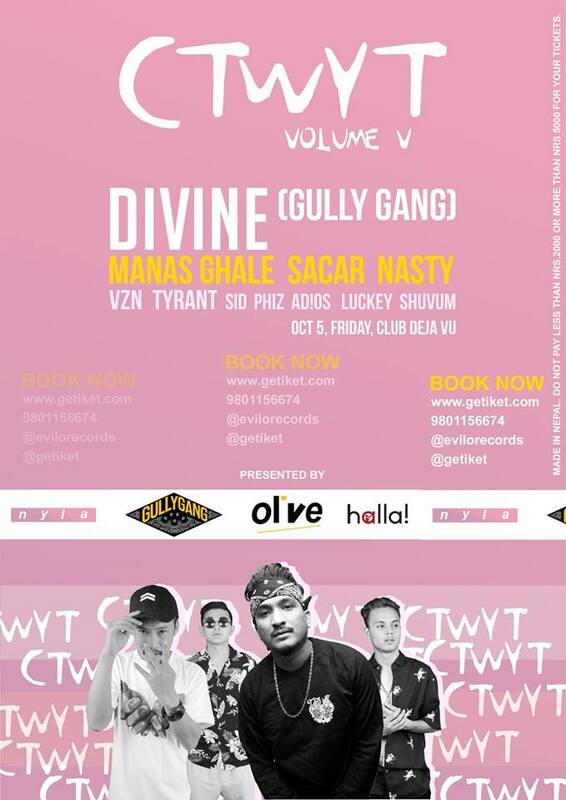 The inspiration behind the upcoming Ranveer Singh, Alia Bhatt starrer Bollywood flick ‘Gully Gang’; Divine had first performed in Nepal in August last year. The event is also one of the most anticipated rap concerts because it will mark the return of Sacar aka Lil Buddha, who hasn’t been very active in the scene lately. Joining the Raw Barz star on stage would be the Nepsydaz emcee Manas Ghale. That’s not all, the line-up also boasts other dope rappers including Nasty, VZN, Tyrant, Sid, Luckey, Adios and Shuvum. Also, guess who’s hosting the event. AYUSH RIMAL. So, where do you get the tickets from? Right HERE.